This week I conducted a little experiment. I read in a time management blog that in order to be super efficient and effective we should only be checking our emails at the beginning and end of the day. Imagine only checking emails TWICE EVERY DAY. How is that even possible? I decided to find out and persuaded a coaching client of mine to join me on a day of email fasting. Apart from two doses, first thing in the AM and late in the afternoon, there would be no emailing or inbox entering for an entire day. Here’s my diary of that day, along with some pretty freakin’ scary insights from this little time management experiment, which might encourage you to give it a go. 9:30am. COLOSSAL, MONUMENTAL, MOUNT EVEREST of a panic attack. Seriously. I am hyperventilating like a fish outta water. Just at the thought of going the entire day without checking my emails. Proceed to drink 2 cups of coffee in quick succession in order to calm myself right on down…??? Nice one Suze #oxymoron. 10:30am. 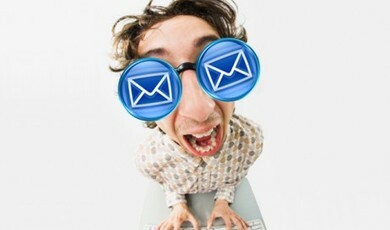 I discover I have developed a severe case of email Tourette’s syndrome. My hand hovers over the “Outlook” button every five minutes, desperate to push that alluring little blue box with its pretty “O”, like a perfectly formed cupid’s mouth, beckoning me to kiss it with my finger. Desperately missing the delicious little ding and ‘fading in/fading out’ notification on the top right-hand side of my computer. I MISS YOU little email notification! Come back to me. Tell me I am a Very Important Person with so many people wanting to get in touch with me. 12 noon. Strangely, I feel lighter, freer. I notice I actually am getting a sh#t load of work done this morning. My panic attacks are beginning to be replaced with a little crown fit for the Efficiency Queen I am quickly becoming. 2:30. Notice I haven’t thought about my inbox for a whole hour. Repeat, one whole hour. Air punch moment. Dance a smug little dance. 4pm. Start to feel the itch to check again, but realise this is coinciding with my usual lull in energy and concentration which normally accompanies this time of day. Have a chocolate bar instead and sneakily surf social websites like a heroin addict on their first methodone programme. 5:30pm. Check email. Flood of relief at being able to press the send/receive button. Although I am a little anxious as all the emails downloaded, I find I get through them in no time and probably quicker than usual, because I’ve blocked out time. Vow to do this experiment more often and release myself from the email inbox’s shackles. No major catastrophes eventuated merely because I hadn’t checked my email continuously throughout the day. I realised that like many digital activities we engage in, it drains our concentration, interrupts flow of work and most importantly, unless you are a professional email inbox attendant (does that even exist?) it’s just not necessary. Most alarming though, was my reaction to my reaction. I realise on a small scale that I am addicted to that melodious ding of the inbox. Thanks so much for your kind words Gede. Cheers, Suzi.